There are a number of exciting LNG liquefaction prospects around the world, both under construction and prospective. The question is how many of these prospective projects will come to fruition, given the slowdown in East Asian, the next wave of projects in the US, Canada and East Africa will be competing to find alternative export markets. The lifting of the sanctions in Iran may also lead to the entrance of a new major player in global liquefaction, challenging Qatar. A range of companies made up of oil majors as well independents are focusing their investments on the LNG liquefaction sector. The global demand for energy is set to grow and gas will continue to play an important role as a fuel, due to its reliability when compared to renewable and its lower carbon emissions when compared to coal. The construction of large-scale onshore liquefaction and regasification terminals is a function of the development of the global LNG industry. Investment in such infrastructure is dictated by unique supply and demand circumstances in different geographies, such as the US unconventional oil and gas boom and the future of Japanese nuclear power generation. Our report assesses upstream asset viability, infrastructure EPC costs and demand-side outlook to anticipate the market direction. The global market for LNG is driven by high levels of spending in established and emerging markets. An important share of future capital expenditure will be driven by the greater deployment of LNG as a fuel, and growing investment in LNG carriers. Who are the leading companies in the LNG infrastructure industry? What political, economic, environmental and technological factors affect the LNG infrastructure market? This independent, 118-page report guarantees you will remain better informed than your competitors. 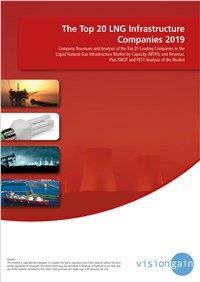 With 114 tables and figures examining the companies within the LNG infrastructure market space, the report gives you an immediate, one-stop breakdown of the leading LNG infrastructure companies plus analysis and future outlooks, keeping your knowledge one step ahead of your rivals.